To get mail you need to send mail. Doing so on your Samsung Galaxy Note or Samsung Galaxy Tab is relatively simple. In fact, if you’ve ever composed e-mail before, you’ll find writing an electronic epistle on your tablet quite familiar. However, the process is subtly different between the Gmail and Email apps. The Gmail composition screen is displayed. 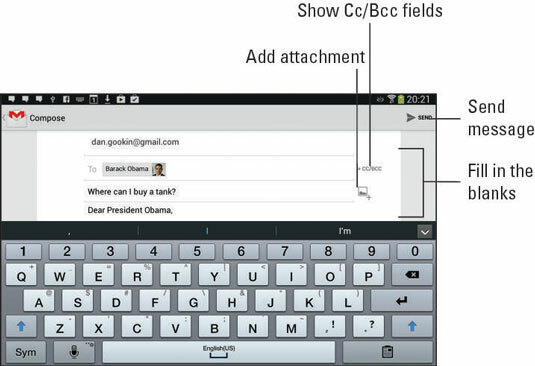 To create a new Gmail message, touch the Compose icon, shown in the margin. Touch the To field to enter the recipient’s address; just type the first few letters and then choose a matching contact name. Continue the Gmail message by filling in the Subject field. Type the message. Touch the Send icon to whisk off the message. Or if you’d rather save it and work on it later, touch the Menu button and choose the Save Draft command. To cancel a message in Gmail, touch the Menu button and choose the Discard command. Touch the Discard button to continue. To work on a draft you’ve saved, touch the App icon and choose the Drafts folder. Touch the draft message in the list, and then touch the Edit (pencil) icon to continue editing. To summon the Cc and Bcc fields, touch the +CC/BCC icon. The Cc (Carbon Copy) and Bcc (Blind Carbon Copy) fields appear, eager for you to fill them in. To create a message in the Email map, touch the Compose icon. The new message composition screen appears. Your main or primary account is shown, but you can choose another account from which to send the message. Fill in the To field by typing a contact’s name or e-mail address. You need only type the first few letters of the name and then choose the person from the list — providing that the person’s account is in the tablet’s address book. Type a subject, and then type the message’s contents. To send the message, touch the Send button at the top of the composition window. Or you can touch the Save button to save the message in the Drafts folder to edit and send later. 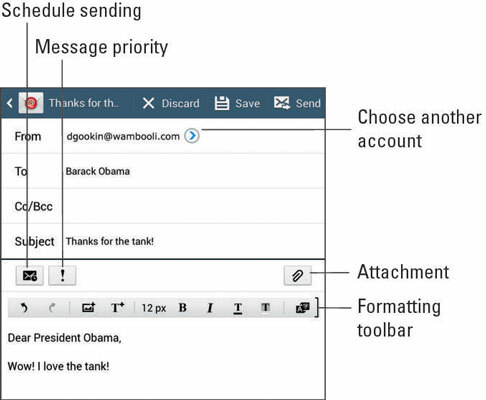 The Email app’s composition window features a formatting toolbar. If you don’t see it, touch the arrow icon on the right side of the composition window. Use the formatting icons as you type or select text and then apply a format. Use the Schedule Sending command to preset a time at which the Email app sends the e-mail. Normally, e-mail is sent right away. Or if an Internet connection isn’t available, e-mail is sent the next time the tablet is connected. If you don’t see the Schedule Sending icon, touch the Menu button and choose the command from there. If the Priority icon doesn’t appear on the screen, touch the Menu button and choose the Priority command. Saved e-mail is found in the Drafts folder associated with the e-mail account you’re using. Select the Drafts folder from the left side of the screen, and then select the draft from the right side of the screen to edit or send. To cancel a message, touch the Discard button. Touch the Discard button in the Sending Canceled window to confirm. Locate the contact to whom you want to send an electronic message. Touch the contact’s e-mail address. Select Gmail or Email to use the related app to compose the message. Touch Always to always use the app chosen in Step 4, or select Just Once to pick an app every time. If you choose Always, the app you choose is always used to send e-mail to a contact; you won’t see the prompt in Step 4 again.